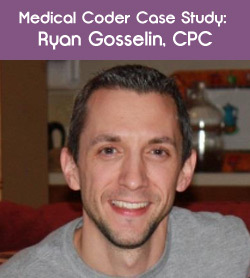 After losing faith in AAPC training, Ryan enrolled at CCO to become CPC® certified in 2 months and advance his career. 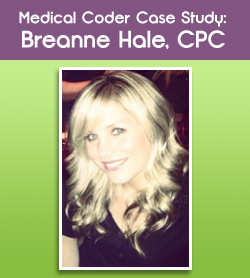 Breanne went from Front Office to Medical Coder with the help of CCO. Read her story. 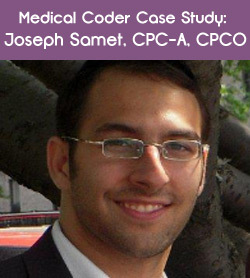 Learn how Joseph samet went from no medical-coding education to passing his certification exams in just a few months. 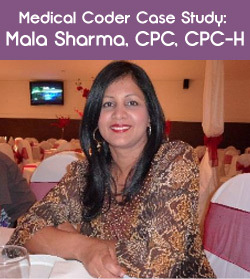 With a full-time job and a child in college, Mala used CCO to work at her own pace and pass the CPC exam. 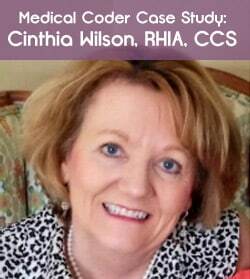 Learn how Cinthia Wilson, RHIA, CCS shifted careers into Medical Coding so she could work from home. 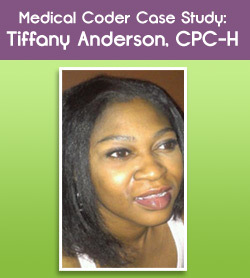 Learn how Tiffany used CCO to get COC® certified and take her on-the-job skills to the next level. 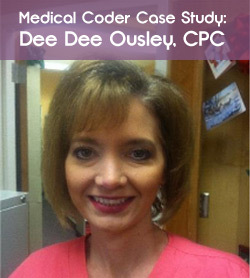 Learn how Dee Dee used CCO to become CPC® certified, get a job and go on to write and edit medical coding books. 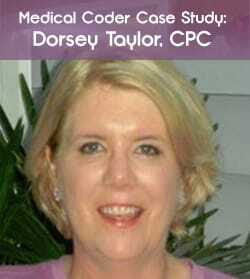 After finding community college courses ineffective, Dorsey used CCO to pass the CPC® exam and shift roles at her job. I enjoyed my experience with CCO and am looking forward to my next course! I passed on my first try! Thank you so much for the help. Going through and marking my CPT manual was especially helpful. I used the notes but I also became more familiar with the manual. Prime Member - passed CPC on my first try!! Thank you CCO!! Wash and repeat..... going after CRC!! Thank you so much for the Blitz Courses, they were crucial in helping me pass the CPC Exam. I just wanted to tell Chandra thank you! The CPMA Blitz helped me pass my 2nd attempt at the CPMA. I took a course a year ago and the Blitz was just what I needed to review and organize. I took her advice and looked at the OIG work plan for 2019. My 1st attempt was in 2018, so the OIG would have a different work plan this year. Sure enough, Podiatry is on their 2019 list and there was a question on this years CPMA about Podiatry. I could not have passed the CPMA exam without your outstanding instructors and tools! Don't think I would have passed without the BHAT® technique, Thanks!!!! I want to thank CCO for this wonderful CPC® course. I'm a registered nurse who knows medical terminology. However, CPT was really challenging for me. Without the BHAT® technique and the instructional videos, there was no way I could have passed the CPC® on my first try! Now, I'm ready to continue to get my next AAPC certification (with CCO's help of course)! Thank you soo much. I used AAPC Study Guide for CPB®, AAPC practice exams , and the CCO CPB Blitz. Also the BHAT® system and your faithful and true ways of taking the AAPC exams. Again thank you and keep up the good work. Thanks Again CCO! Your products has helped me earned my 3rd credentials as a coder! I miserably failed my first CPC exam, then after about a 100+ job applications later and no interviews, I stumbled upon CCO through YouTube. From there, I learned about a whole organization that has forever changed my life. I purchased the CPC Blitz package and watched every video, completed every SINGLE page of the BHAT® system, and took practice exams. I passed my CPC exam the second time by bringing my grade up by 26%! !I now have a coding job (that I obtained the same month I got my CPC) for the number one hospital in my area and I couldn't be more grateful to CCO for extending the knowledge and help for me to become successful. I really wanted to thank you guys for a great Blitz program. I passed my exam the first time, and the BHAT® helped me tremendously! I have been a registered nurse for years, and I knew a little about coding from my clinic management days, but had to get certified for a new job at a major insurance company. Didn't really know where to start, so a coworker recommended the Blitz to me. Everyone I know that has used your Blitz has passed, and I will definitely recommend it to other coworkers and friends. Hello Everyone, I passed the CPC exam on my first try. With the help of the PBC and the MTA course as well as the CPC blitz, BHAT technique, watching Laureen time management videos, and doing lots of practice exams getting over 85%, I felt really confident during the test. I want to thank CCO for providing such a wonderful, interactive course for new coders to learn and become confident in their ability to become a coder. I am forever grateful and plan to stay with CCO to pursue further certificates and to stay certified. Thank you CCO. I took the CPC exam in April of 2017 and passed on the first try. I contribute that to CCOs techniques that I came across on youtube. I watched as many free videos from them that I could find. When I decided to take the CPB in 2018 I knew I would definetly go thru CCO for guidance. I purchased the CCO CBP Blitz review in March of 2018. I studied exactly what they told me to when I had time, and passed my CPB exam on the first try in December of 2018. CCO knows exactly how to help you pass and I am now Certified Professional Coder and Biller because of them sharing their knowledge. Thanks CCO Team!!! Keep up the great work!